WetBrush Metallics, Red. Classic design with aesthetic finish. WetBrush is specially formulated with IntelliFlex™ bristles. These bristles are thin, strong and very flexible. This allows them to be flexible on one stroke and firm on the next. It eliminates all tugging, tearing, pulling and ripping of the hair to ensure no split ends or hair loss while providing healthy brushing and detangling. These bristles will glide through any hair type, combing out tangles effortlessly. Bristle flexibility enables protective and pain-free detangling. Bristles bounce back to their original form after each stroke eliminating all hair breakage and pain usually associated with hair brushing. The perfect transition from wash to style. Features SofTips™, twice-dipped, ultra-soft ends that are guaranteed not to fall off. Ensures ends are soft, full and permanent. Extremely gentle, ideal for sensitive scalps. Located at the very top of the bristles, they massage the scalp to stimulate circulation at the follicle. They are firm enough to comb through knots, yet flexible enough to be gentle on the scalp. Can be used on wet or dry hair and works on extensions and wigs. I was very surprised with the wet hair brush. 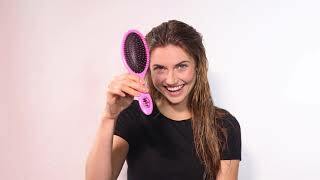 But it works really well, I have long thick hair with bleached ends but the brush just glides through both it, WET or DRY . 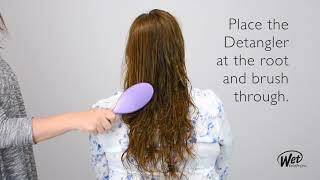 NO PULLING or BREAKING of the hair strands!